Among milk based Indian desserts , kheers have always been my favorite. I am amazed by the umpteen variations we have. The basic ingredients remain the same, but the name varies , the cooking procedure and the taste varies from state to state, from family to family. For today I have a Maharashtrian Kheer, called Tandalachi Kheer. Rice is called Tandul in Marathi and hence this name. This kheer reminded me of the Phirni where I soak the rice and grind, here they have been roasted and ground. The kheer tasted delicious and had mixed reactions. Well everyone loved it, only there were lot of comparisons.Some found Phirni better while others felt the roasted rice lend a wonderful flavor to the kheer. 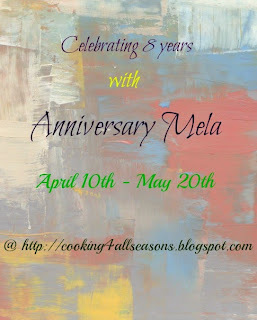 The kheer is my Day 2 post under Creamy stuff and it goes to Valli's kids delight which is being hosted by Mireille this month and Anniversary Mela at Valli's place. Dry roast the rice on medium fire, till you get a wonderful aroma and the rice is slightly brown. Grind the dry fruits coarsely. Boil 2 cups of water and add rice and cook till rice is completely cooked. Add the ground dried fruits. Add ghee , milk and cardamom powder. Once cool, chill , serve in individual bowls and garnish.